Several U.S. Mint images of 2019 Apollo 11 50th Anniversary Commemorative Coins. A joint U.S. Mint and Royal Australian Mint product will include a U.S. Apollo 11 50th Anniversary Half Dollar paired with an Australian 50th Anniversary of the Moon Landing 1 oz. $5 Silver Coin. The pair of dome-shaped coins will be released in a limited-edition set that is sold and distributed by the Royal Australian Mint. Its price and limits have not yet been announced. "This jointly–issued coin set magnificently symbolizes our long standing alliance and friendship with Australia," U.S. Mint Director David Ryder said Thursday, Jan. 10. "Many Americans will remember listening for the critical reports from the tracking stations in Australia at Carnarvon, Honeysuckle Creek, Tidbinbilla and Parkes, as the Apollo 11 spacecraft traveled to, orbited and landed on the Moon." One of the half-dollars will be a part of the jointly-issued set. 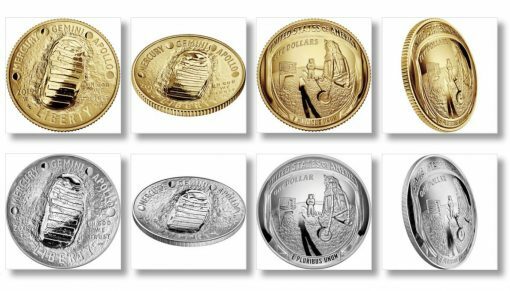 "We are very pleased that the Royal Australian Mint is entering into a product partnership with the United States Mint to bring customers a unique collectible that marks one of mankind’s most remarkable achievements," said Senator the Hon. Zed Seselja, the Australian Assistant Minister for Treasury and Finance. "The collaboration highlights the unique part Australia had to play in sending a man to the Moon." The U.S. Mint and the Royal Australian Mint will announce the release date for the set as soon as it has been determined. The U.S. Mint will market the set on its website and provide a link to the Royal Australian Mint’s website for U.S. customers wanting to buy the product. I see the one ounce Apollo silver coins will all have the usual $1 face value, but hold on to your hats because the five ounce coins will also have the same $1 face value. In my book that makes this an error coin that needs to be changed quickly to $5. Will this huge US Mint oversight cause these large five ounce coins to skyrocket after all 100,000 sell out next Thursday the 24th of January for $225 each? If I remember correctly though the US Constitution only allows minting silver coins with a maximum $1 face value, no matter how many ounces or pounds of silver each coin may contain. I’m buying as many as possible. This will sell out in a heartbeat. It’s like playing the lottery! You’re right, these very impressive looking and large 5 oz. pure silver curved masterpiece proof coins will sell out in a heartbeat. So will the $5 curved gold proofs. Uncirculated prooflike coins will be a win/win opportunity as well, but few will be minted. Good luck tomorrow! David aced sellout but uncirculated gold coin sells at only 27% premium to spot gold price with mintage limit of 25,000. 5 oz. Silver premium over 192% to spot with100,000 limit. Still no sell out in gold yet today.